Amoeba are shapeless (they look like a big blob) unicellular organisms from the genus Protozoa. Image of amoeba captured with the digital BA210 microscope at 100x magnification. Image courtesy Pearson Scott Foresman. 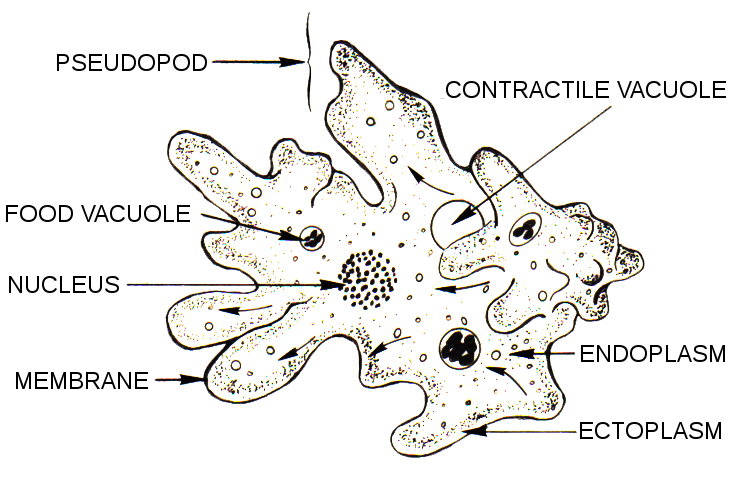 An amoeba's cell's organelles and cytoplasm are enclosed by the membrane. Ameoba have one pseudopod used for navigation and movement. Each amoeba has one or more nuclei and a simple contractile vacuole to maintain osmotic equilibrium. Food enveloped by the amoeba is stored and digested in vacuoles. Image of amoeba captured at 400x with a biological student microscope.